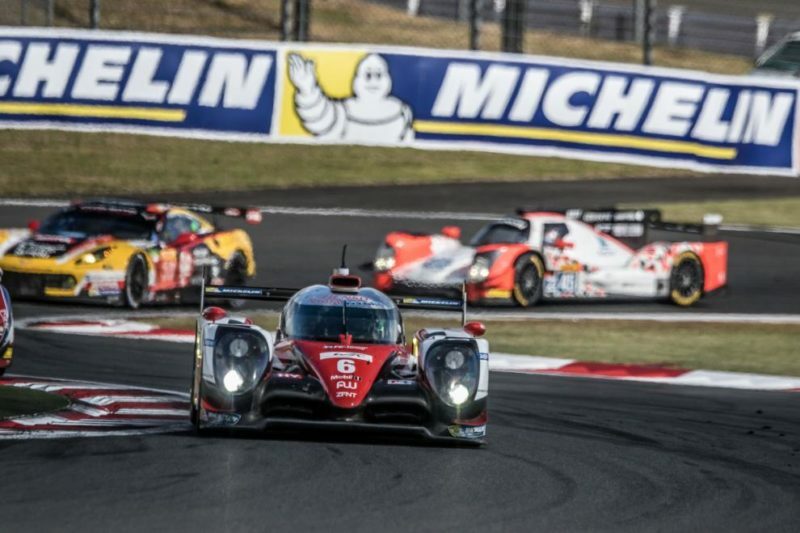 Kamui Kobayashi, Mike Conway and Stéphane Sarrazin took a cathartic victory for Toyota at their home race in Fuji after a gripping tactical battle over six hours. The #6 car was followed home by the #8 Audi R18 of Lucas di Grassi, Loic Duval and Oliver Jarvis and the #1 Porsche 919 Hybrid of Timo Bernhard, Brendon Hartley and Mark Webber. The #8 Audi put in an almost flawless start from pole, driving away from the rest of the field in the early stages to lead by a small margin. However, the #6 Toyota TS050 and #1 Porsche 919 Hybrid were never far behind, with the lead constantly changing during the pit stops over the course of the race. There was no such luck for the sister #7 Audi, however, which was forced to retire from the race early on after losing its front-axle hybrid system. Despite disconnecting the system from the rest of the car and getting back out on the track after a 90-minute stop, the stewards ruled that the car no longer complied with its homologation and effectively disqualified it. The gripping tactical battle among three equally matched cars culminated in a straight shoot-out for victory in the final hour. Kamui Kobayashi embarked on his final stint just eight seconds ahead of the erstwhile leader, Loic Duval in the #8 Audi, with only half an hour of the race remaining. Duval gave it his all in his chase of Kobayashi, taking the chequered flag just 1.5 seconds behind the #6 Toyota TS050. For Toyota, this marked their first WEC victory since the Six Hours of Bahrain in 2014 and provided at least some payback after the team’s Le Mans heartbreak in June. 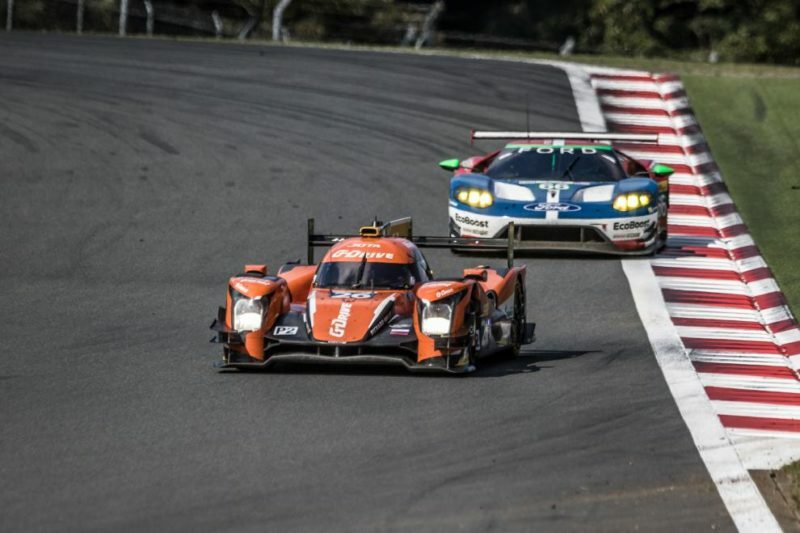 In LMP2, G-Drive Racing converted their pole position to lead the field throughout the race while the remainder of the pack battled tooth and nail behind. The #36 Signatech Alpine car battled hard with the #43 RGR by Morand machine and the #31 ESM crew in the early stages, providing some of most exciting racing of the day. What appeared to be a dominant performance from G-Drive Racing turned into another final-hour shoot-out. A completely green race allowed each team’s strategy to play out uninterrupted, and RGR Sport by Morand appeared to have pulled off an outstanding strategic move – appearing from the pit lane just ahead of the #26 machine with only half an hour remaining. One lap later Will Stevens’ #26 Oreca caught and passed Bruno Senna’s #43 Ligier – but the questionable move on the long start/finish straight was deemed excessive by the race director and Stevens was ordered to give the position back to Senna. The Brit wasn’t fazed by the punishment and, after surrendering the lead back to Senna, slowly caught back up with the Brazilian with just ten minutes left. This time the G-Drive man made it count, passing the RGR Sport by Morand car fairly this time and securing the first victory of the season for the Russian-entered team. GTE Pro was a story for Ford dominance, after the US manufacturer secured a relatively simple one-two on a circuit to which the new-for-2016 Ford GT was evidently suited. Victory went to Andy Priaulx and Harry Tincknell – their first in the Blue Oval’s debut WEC season – some fifteen seconds ahead of their teammates Stefan Mücke and Olivier Pla in the #66 machine. Ford’s Fuji dominance means that the championship battle remains tight, with Ferrari’s 27-point haul giving the Italian constructor a three-point lead in the GT manufacturers’ title ahead of Aston Martin, who only managed to secure eighteen points. Paul Dalla Lana, Matthias Lauda and Pedro Lamy recorded their fourth win of the season in GTE Am in the #98 Aston Martin. Championship leaders Rui Aguas, Emmanuel Collard and Francois Perrodo finished second for the #83 AF Corse crew to reinforce their title challenge, while KCMG made it three different manufacturers in the top three positions by securing third.